Alabama Crimson Tide: Will this class be better than the 2008 class? Nick Saban has been nothing short of remarkable in his six seasons with Alabama thus far. Since landing in Tuscaloosa in 2007, Saban has brought in the No. 1 recruiting class six times. This year proves to be nothing different. The Crimson Tide brought in the No. 1 class in the nation headlined with huge names, such as Cameron Robinson, Rashaan Evans, David Cornwell and Jacob Coker. Though this class looks to be promising, the 2008 recruiting class will always have a special place in Saban’s heart. In his press conference on National Signing Day, Saban told the press that it was the ’08 class that brought us [Alabama] back to prominence. He said those guys came to Alabama at a time when we weren’t the sexiest place to be at. With the contributions of Mark Ingram, Julio Jones, Marcell Dareus, Mark Barron and others, Alabama went from being a mediocre team to a powerhouse in the Southeastern Conference. The Crimson Tide won a national title in the 2009 season and obtained its first Heisman winner from the 2008 class (Ingram). To be honest, it was the explosive play making abilities of Ingram, Dareus and Jones that inspired other athletes to desire to come to Alabama. In the press conference, Saban said he was very satisfied with the size and character of this year’s class. He mentioned that this class fulfilled every need Alabama had going into the offseason. Despite the Tide finishing 11-2 this season, there were some holes in the armor that needed to be fixed. Defensively, Alabama is usually excellent against the run. However, the Tide surrendered 106.2 rushing per game this season. With CJ Mosley, Adrian Hubbard and Jeoffrey Pagan in the NFL Draft, Alabama needed to recruit players who had the combination of size and speed to fill their shoes. In getting Da’Shawn Hand, Jarran Reed, DJ Pettway, Rashaan Evan and Christian Miller, the Crimson Tide fulfilled the need. At 6-foot-4, 262 pounds, Hand is a rangy athlete. He reminds many people of Courtney Upshaw with his size and ability to play multiple positions on defense. Hand was recruited to Alabama as a defensive end, but he can also play the jack linebacker position. The Tide hasn’t had a pure pass rusher since Dareus and Upshaw, but the upside for Hand looks very promising. Not only are his pass rush moves effective, but Hand’s ability to stuff the run is also impressive. One thing about Alabama is they love bringing in junior college players. Jarran Reed and D. J. Pettway were huge signs for the Crimson Tide on defense. Both players have size along with great footwork. They can create havoc on the quarterback and stuff the run. Alabama struggled with high-powered offenses and dual threat quarterbacks this season. With the additions of Reed, Pettway and Hand to the line, the Tide will look to create more pressure on opposing teams next season. In recent seasons, the leadership position on defense for Alabama has been the linebacker position. Rashaan Evans, Christian Miller, Shaun Dion Hamilton and Keith Holcombe will look to continue the trend next season. In stealing Evans from Auburn, the Tide got a major boost. At 6-foot-3, 217 pounds, Evans excels at stopping the run to the outside. Like Mosley, Evans has great quickness in moving from sideline to sideline. Though he can create a pass rush, Evans best trait is tackling in space. 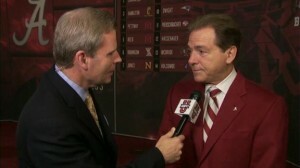 At the heart, Saban is a defensive backs coach. He’s hard on cornerbacks and safeties the most because he believes that all defensive backs should know how to breakdown and tackle along with how to play the ball. Alabama’s pass defense was good this season. The Tide surrendered 180.3 yards per game and 13 touchdowns. The Crimson Tide’s secondary forced 11 interceptions this season. With Ha Ha Clinton-Dix and Vinnie Sunseri in the NFL Draft, Alabama restocked its secondary by signing Tony Brown, Marlon Humphrey and Laurence “Hootie” Jones. Bo Scarbrough was signed as an athlete, but can very well play defensive back. Both Brown and Humphrey have size and speed at the cornerback position. At six feet, 196 pounds, Brown excels at man-to-man coverage, zone coverage, ball skills and run support. Weighing in at six feet and 179 pounds, Humphrey excels at zone coverage, run support and instincts. The 2008 equivalent to Jones would be Mark Barron. Like Barron, Jones is a hard hitter at the safety position. He excels at zone coverage in the aspect of driving on the ball and either laying a deadly hit on a receiver or cutting underneath to make the interception. Alabama averaged 38.2 points and 454.1 yards of offense per game this season. With Doug Nussmeier out and Lane Kiffin in, the offense should be more explosive next season. Offensive line coach Mario Cristobal has a lot of talent to work with now. In signing Cameron Robinson, the Crimson Tide has an offensive lineman that can start right away at left tackle. With Cyrus Kouandjio entering the NFL, Robinson will be expected to come in and help the offensive get back to imposing its will against opposing defenses. He excels in both run blocking and pass blocking along with space blocking. Though it’s way too early to tell, Alabama fans are starting to draw a comparison with Ross Pierschbacher to Barrett Jones. Jones was a renaissance man in his tenure at the Capstone. He played right guard, left tackle and center. He excelled at all three positions and was a major piece in three national titles (2009, 2011 and 2012 seasons). The upside of Pierschbacher looks promising. He is good at blocking in space and he has a lot of toughness. When was the last time Alabama recruited two physical quarterbacks? This may be the first time this feat has happened. Jacob Coker (6’5, 230 pounds) and David Cornwell (6’5 240 pounds) are the two featured quarterbacks in the six man battle for signal caller next season. Both guys are accurate passer and have great footwork in the pocket. Unlike McCarron, Coker and Cornwell are more mobile and can throw on the run. It will be interesting to see which one gets the job, but whoever obtains it will have a ton of talent to work with. The Crimson Tide is known offensively for having double tight end sets. In recent seasons, Alabama had Michael Williams, Colin Peek, Preston Dial and Brad Smelley. Next season, the Tide will open up with OJ Howard and Ty Flournoy-Smith at tight end. Despite the size, both guys have breakaway speed. If Kiffin can use these two correctly, opposing defenses will have nightmares. With Cameron Sims and Derek Kief added on the list of talented receivers, Alabama is bound to run up the scoreboard a lot next season. At 6-foot-4, 190 pounds, Sims has great hands and speed. He excels at catching the ball in traffic and getting yard after the catch. Like Sims, Kief (6’5, 198 pounds) has great hands and make the catch in traffic. As of right now, Kiffin has just as much talent at Alabama as he had at USC if not better. He has the keys to the car; all he has to do is keep the car in the road. One thing that this class and the 2008 class have in common is the players came in together. In 2008, Alabama fans wondered would the Tide ever be dominant again. It was hard for Alabama to win after the eras of Wallace Wade, Frank Thomas, Paul Bryant and Gene Stallings; nonetheless, the players still came to Alabama and bought into what Saban had to offer. The’08 class went on to win a national title. On paper, this class is more talented than the ’08 class. The potential to win national titles is very high for this class. The question is how bad do they want to win?